Udemy.com Online Training Courses 60% off through March 24, 2014 for TheApproachingDayPrepper.com readers. Udemy.com is an online training resource with courses offered in everything from popular to obscure software packages…From beer making to aquaponics…From foreign languages to growing medicinal gardens…From yoga to how to predict the weather or how to train your dog. So whether you want to improve your on-the-job skills, learn a new hobby or increase some prepper skills you’ll find some courses at Udemy.com to help. We found courses on aquaponics, growing medicinal plants, aromatherapy, self-defense and gardening (as well as some business courses we’ll be taking). When you purchase a course at Udemy.com you have lifetime access to the videos. Their website boasts that 2 million students from more than 190 countries are taking online courses at Udemy.com. Udemy.com has offered readers of TheApproachingDayPrepper.com 60% off the price of most courses purchased by March 24, 2014. Use coupon code THANKS317 when ordering. Click here to check out their courses. At 60% off, the aquaponics course is less than $20 (we’re kicking ourselves for buying it two weeks ago). When I’ve thought about container gardening, I haven’t thought of it as “serious gardening.” I haven’t thought of using container gardening to grow enough food to make a dent in your grocery bill. Container gardening? That’s like a petunia in a pot, right? I’m learning that my thinking has been wrong, because that’s exactly what a growing number of people are doing. Phil’s sister was the first to introduce us to serious container gardening. She has containers all over her porch, along the back of her house and throughout her yard in Florida. She doesn’t do it because she has to; she does it because it’s efficient, effective, and so much easier than traditional gardening. And that’s what this series of blogs is about – making gardening easy. In fact, container gardening might be the easiest of all approaches to growing food. But there are other reasons to consider container gardening. Looking for a way to start small? You can’t get any smaller than this. It’s great for city dwellers because you can garden on your patio, balcony or porch. It requires less weeding (the most time consuming part of gardening). If you move, you can take your garden with you! You will not have lost all the effort associated with making a traditional garden plot or raised beds. As with raised beds, container gardening can make gardening accessible to people with handicaps. Get your kids involved with gardening by giving them each one or more containers to tend. It’s way better than a pet rock. It allows you to extend your growing season in a number of ways. The soil in your containers will warm up faster than the ground soil, so you can plant sooner. You can move the containers around as the growing season progresses, taking advantage of the sun and shade appropriately. Covering your containers may be easier than covering a traditional garden so you can grow later in the season. Because you can locate containers in areas shielded from harsh weather or even inside your house, you can grow plants that are outside your growing zone. Try out new vegetable varieties on a small scale by planting them in containers. See which ones do best in your climate and go all in next year. Container gardening can add decorative elements to your home and yard. Container gardening probably isn’t new to you. If you have any house plants, they’re probably in containers of some sort. But growing food in containers may be new to you. 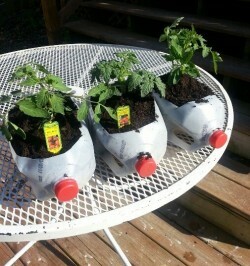 Imagine, though, growing cherry tomatoes in plastic milk jugs. Just step outside and have a tasty, healthy snack or pick some tomatoes to add to your salad. 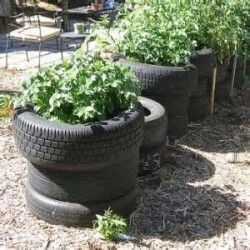 Or how about growing potatoes in a stack of old tires? If you can let your imagination go a bit further, imagine that you are growing a significant portion of your vegetables in containers. Your container can be anything that holds soil and will allow water to drain. Anything. Be creative – you can grow plants in anything from a beautiful glazed pot to a piece of an old gutter. If you’re creating your garden on the cheap, search your home and thrift stores for pots, baskets, and other containers. I’ve seen pictures of people growing plants in plastic shopping bags filled with soil. Your containers can sit on the ground, hang from a stand or beam or attach to a structure (like a window box). Large containers will cost more to fill, but you won’t have to water them as often. Drainage holes are a must. Without them, you’re plants will drown. Terracotta pots will dry out more, causing you to need to water more frequently. You’ll want to match your plant to the container. For example, a tall or heavy plant requires a container that won’t tip over as the plant grows and a spreading plant will need room to spread. Don’t use a container that is too narrow. Similarly, you’ll want to adjust the number of plants in the container to the size of the container. Remember, the roots of your plants will need room to grow. Your ground soil is may (or may not) be fine for traditional gardening, but it doesn’t work well for container gardening. It just doesn’t provide all of the air, water, and nutrients that potted plants require in order to be healthy. A better idea is a mixture of peat moss, vermiculite, potting soil, and compost. This mixture will give your plants a loose soil that is ideal for the spreading of plant roots, and holds a good amount of moisture while still allowing for good drainage. Everything has its downside, and container gardening is no exception. Here are a few things to watch out for. Although your container garden will require much less weeding, your plants will require a bit more attention. Plants aren’t accustomed to growing in containers. They’re accustomed to spreading their roots to provide stability for the plant and to search for nutrients and water. Since they can’t do that in a container, you’ll have to take care, especially when the plant is young, to manage the plant and soil. Because there is less soil in the container, it will warm up faster than the ground soil – that’s the advantage. But the reverse is also true. Less soil also means that the soil will cool more rapidly when the temperature drops, so precautions have to be taken to keep your plants warm. Because you will be watering your plants frequently in containers with drainage holes, the plant nutrients will get washed out of your soil and will need to be replenished. That means using fertilizer on a recurring basis. Container gardening is as easy as it gets. With a very small space and some TLC you can soon be enjoying the fruits of your labor — without much labor at all. In our last blog, we talked about raised bed gardening. Square Foot Gardening is a refinement of raised bed gardening. It uses high-intensity gardening methods to get the most production out of a modestly-sized raised bed garden plot. Traditional farming plants in rows, allowing space between rows for walking. This wastes space – lots of it. In square foot gardening, you plant in the raised beds, allowing space for walking between the beds. You will save space – being able to grow the same amount of produce in about 20% of the space. You will save water – because you won’t water all that space between the beds where you’ll be walking. You’ll save time and effort by not needing to weed all the area that you walk on to prevent the weeds from taking over your planted rows. And you’ll experience all the benefits of raised bed gardening. If you’ve gardened before, moving to square foot gardening will require some change in your thinking, but you’ll quickly adapt. Gardeners typically think in terms of rows of plants and they lay out their gardens accordingly. In square foot gardening, you’ll be thinking in terms of square foot sections in a 4′ by 4′ grids. Generally, each 4 x 4 grid is broken into sixteen one-square-foot sections for planting (like the one in the picture above). Within each square foot section, you’ll place one type of plant (either seeds or transplants) and you’ll plant 1, 4, 9, or 16 plants in it. Yep, you read that right, you’ll plant as many as 16 plants in some of your squares! 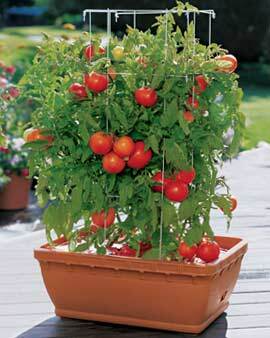 For some larger plants such as tomatoes, you’ll use multiple squares for a single plant. In your first year of square foot gardening, you’ll find that less work is required than preparing a traditional garden, but you’ll incur more expense. Instead of spending your springtime preparing your soil by weeding and roto-tilling the dirt, you’ll build raised bed frames and fill them with a custom soil mixture, at least some of which you’ll have to buy. After the initial start-up costs associated with building these beds, you’ll find subsequent years to be easier and less expensive than traditional gardening. One of the great things about raised bed gardens is that you can place the beds anywhere. Don’t feel limited to the spot in the back corner of your yard that had previously been your garden plot. Of course you’ll want to put it in a sunny place, but because the garden will be in beds, you can put it nearer the house and it’ll look great. Putting it closer to your house will also be an encouragement to go outside and grab some fresh produce to add to your meal! And it usually puts it closer to your water source which – you guessed it – makes your gardening easier and more likely to be done! Mel recommends creating your beds from wood, but you can use anything that will create the squares – bricks, decorative garden edging, or concrete blocks. Last year was the first year we did any square foot gardening and we opted for concrete blocks. They’re not as pretty as the other alternatives, but we wanted the flexibility of creating some beds that were 4′ x 8′ last year, but changing it up to being 4′ x 4′ this year if that made more sense when 2014 planting season came around. (As it turns out, we’re sticking with the 4′ x 8′ bed.) Also, we knew that we wanted our beds to be two blocks high instead of just one high. While this increased the cost of creating the beds, it was kinder to our backs and we were more comfortable growing root vegetables in it. We’ve always been fans of function trumping form so the concrete blocks won out. But we readily admit that wood beds look much better. Once you’ve got your raised bed frames made, you’ll want to fill them with soil. Mel recommends a mixture of 1/3 blended compost, 1/3 peat moss, and 1/3 coarse vermiculite – equal parts of each, measured by volume, not by weight. You can find all of these ingredients at your local plant nursery. Our nursery delivered everything to us just hours after placing the call to them. Once your frame is made and you’ve filled it with Mel’s mix (or your own custom soil recipe), an important step remains – you must add the grid to it. It’s not square foot gardening if you don’t have the actual grid in place. You can use furring strips or heavy twine or anything you like, but don’t skip this step. You can’t rely on your ability to eyeball a grid that isn’t actually marked out. Take the time to create the grid and place it in or on your raised bed frame. We used wooden furring strips that cost almost nothing at our local hardware store. Then comes the planting. The trick is in knowing how many plants each square can accommodate, and that depends on what you’re growing. Mel’s book [INCLUDE LINK] gives tons of details about many vegetables – including info about starting, growing, harvesting, and the all-important number of plants per square foot. If you’re not buying the book, check out this link: [http://www.mysquarefootgarden.net/plant-spacing/]. We loved it. The truth is that we don’t really enjoy traditional gardening. If we had more space, that might be the best way to go, but for our in-town backyard, it just doesn’t make much sense. Yet we thoroughly enjoyed our first foray into square foot gardening. The only down side was that we got a late start. Where we live, gardens should be planted in the last two weeks of May. We got our garden planted in mid-June. It severely impacted our harvest because we ran out of growing season before all of our plants were ready to pick, but we still did pretty well. We planted Roma, cherry, and slicing tomatoes, beets, pole beans, cucumbers, carrots, onions, bell peppers, and lettuce. We had lots of tomatoes (many that we picked green and allowed to ripen after we brought them at the end of the season), lots of pole beans, some beets and cucumbers (they were really good). We also had a few carrots and onions. We have absolutely never been successful with peppers and we weren’t successful with them in our raised bed garden. But we’ll try again because I like peppers but they are so expensive in the store. Also, our lettuce didn’t work at all. We had an extremely rainy season, so that may have hurt our lettuce. We are definitely going to do more square foot gardening this year. Every gardener continues to learn something every season, and we’re eager to put what we learned last year into place for this coming summer. Growing some of your own food is tremendously rewarding. In our predominantly urban culture, vegetable gardening has become a lost art. The time may come when we need to rely upon it as a primary source of food for our families. Don’t wait until you have to know something to start to learn it. We encourage you to start a garden this year, even if you’ve never done it before.